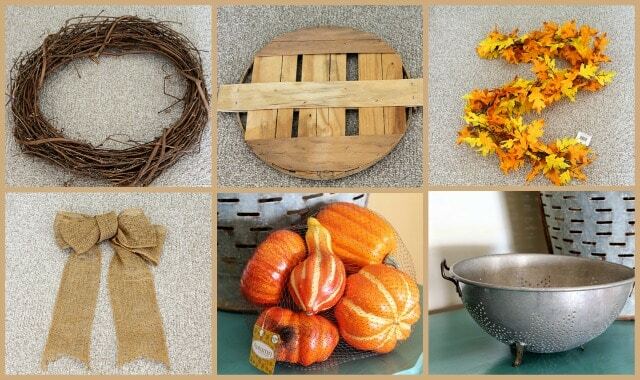 This easy to make fall wreath tutorial is a inexpensive DIY project you can whip up this weekend. You probably have half the supplies in your house already! I needed a new fall wreath this year, since the chipmunks did a number on my old one. Who knew they would want to eat my acorns? And since money doesn’t grow on trees (as opposed to acorns), I decided to throw one together myself. If you want to make a quick and easy wreath for yourself, this is what you’ll need. I used floral wire to wire the bushel basket lid to the back of the grapevine wreath. 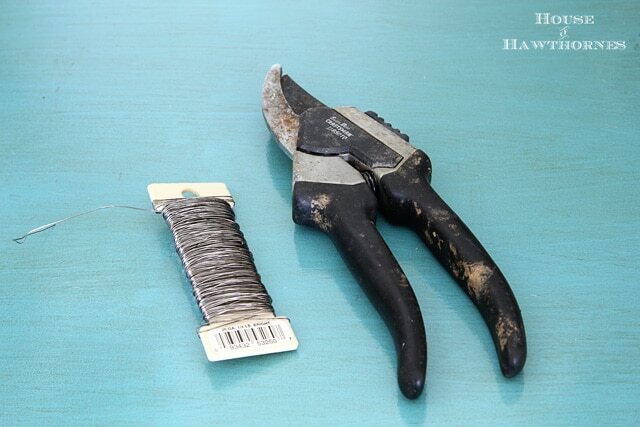 You could also use twist ties or hot glue if you don’t have a ridiculously extensive collection of floral wire. Some people hoard empty food containers, I hoard floral wire. And yes, I did use dirty gardening pruners to cut my floral wire. Why use the proper tool, when you can just run out to the garage and grab the first thing you see. This is where it gets really complicated, so pay close attention. Take the garland and lay it on top of the grapevine wreath. Use floral wire or hot glue to attach it. Hope I didn’t lose you on that last step. OK, so then attach your bow. Again, floral wire or hot glue will do the deed. I may have some extra floral wire if you run out. I played around with just adding a large pumpkin to the wreath, but decided on using a colander filled with smaller pumpkins for a more unique fall look. I wired the colander onto the wreath and then hot glued the pumpkins/gourds onto the colander. Easy peasy, pumpkin pie squeezy. The whole shebang took ten minutes to make. BTW, if you need a tutorial for making a bow, Ann from On Sutton Place has a nice one HERE. Now get out there and let’s show these chipmunks they can’t ruin our fall decor. It’s us against them and pretty always wins! This is so fun, Pam! 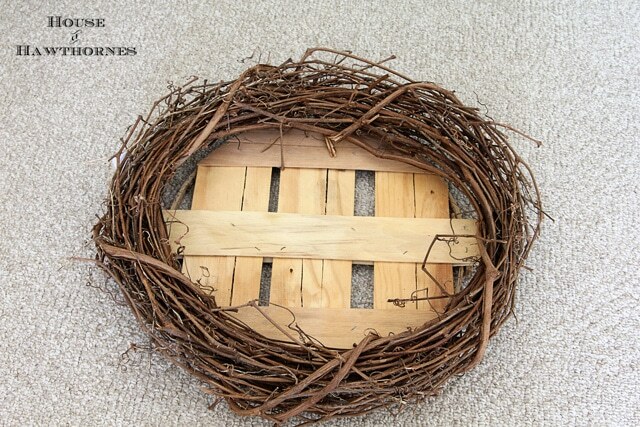 I really love the idea of using the basket lid for a backing…great support for any kind of wreath! Thanks for sharing! Love your sense of humor AND your wreath! The old colander is a great touch. You have inspired me to get busy with fall decorating. 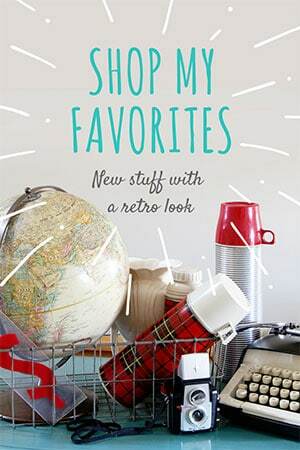 Fun and eye catching! Thanks for sharing your creative inspiration. LOVE it. Particularly the colander with pumpkins, gourds part. Burlap bow is awesome too. This is the day for wreath posts! Love the colander. Always a fan of burlap too. Great mix of textures and fall treasures. Another winner! It’s so bright and pretty! I like how unusual it is with the colander and the back on it. Wow! That’s adorable! It is drenched in everything fall- love all of the different elements you’ve used. Cute, cute, cute! That came out so cute. Are you going to the CL Fair. If so when will you be there. Sweet. We’ve had wreath rodent attacks here, too. Pervasive little buggers. @Debby – I’ll send you an email, but yes, I am going!!! I love the colander and the basket lid you added to your autumn wreath! I heard a rumor that there are toothless chipmunks roaming your neighborhood. Have you checked your wreath today? Darn chipmunks. I’m totally in love with this wreath! 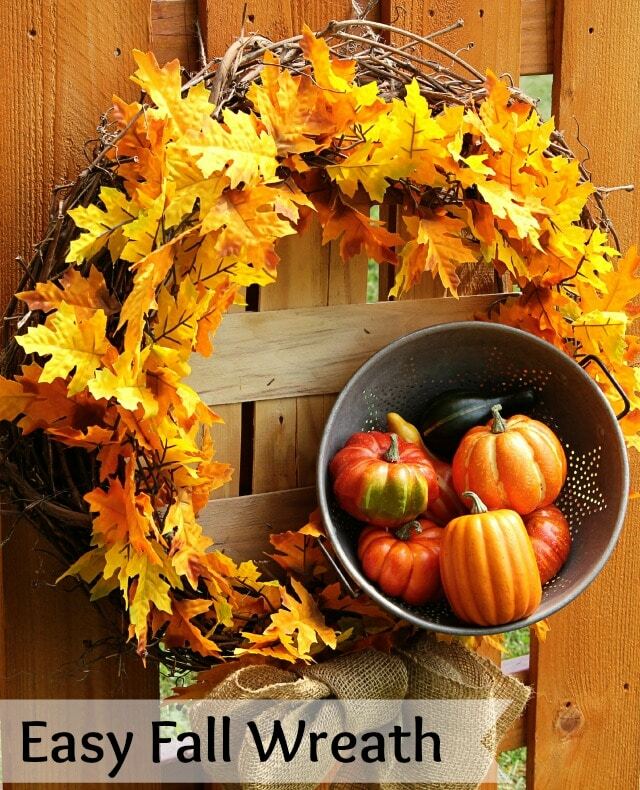 What a beautiful fall wreath! I love the basket lid and the colander! 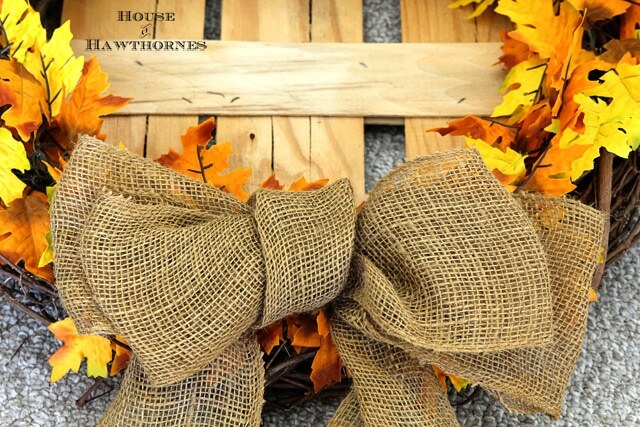 Especially love the burlap bow! Thanks for sharing! That’s just cute as it can be! I love fall so much! Love the use of the colander! Love it! 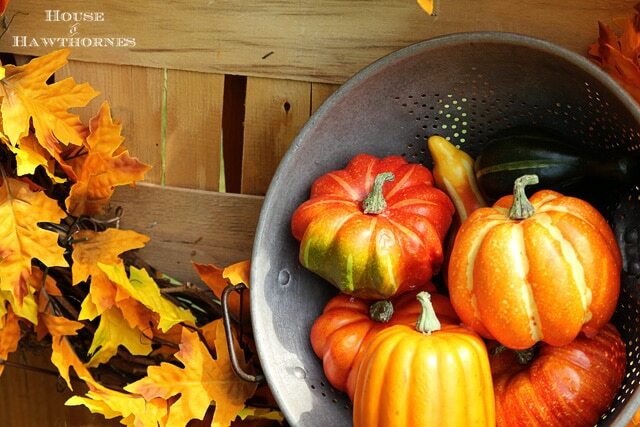 the pumpkins in the colander just give extra fall punch. love it! love the addition of the colander – super cute! 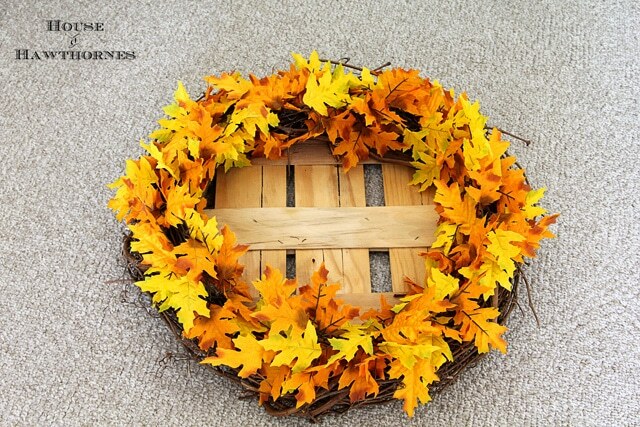 Wonderfully original, cute wreath! The colander with the gourds is perfect. The basket lid adds another layer of interest. It looks great on the fence. We are supposed to be out of the near 100 degree temperatures by tomorrow and I am starting to dream of Fall. Your wreath is perfect Pam. I like all the layers and the extra’s added to make it one of a kind. Hi Pam! I absolutely love your wreath and am sharing it on my FB page today. Thanks so much for sharing it with us and have a happy Thursday! You are so creative Pam! I love the idea of that wood backing on the wreath, I haven’t seen that before. Great job! Anything to outsmart the squirrels and chipmunks is great in my book!!! We love what you have done. 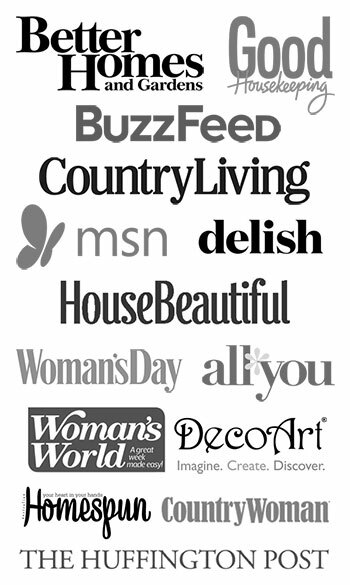 Please come share it with us at http://obsessiveandcreative.blogspot.com Craft Frenzy Friday! The party starts Thursday to 7pm cst. I won’t be a party without you! I really love the colors here. And the colander of pumpkins is such a great touch. 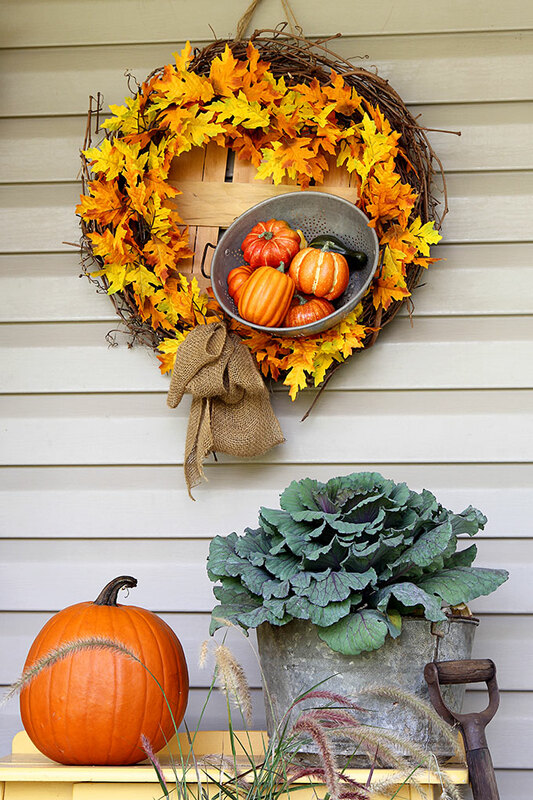 Seeing your colorful Fall wreath reminds me that I want to get mine down from the garage rafters and hang it outside of our front entrance. Thanks for the remidner! Just now working on making a wreath like this. 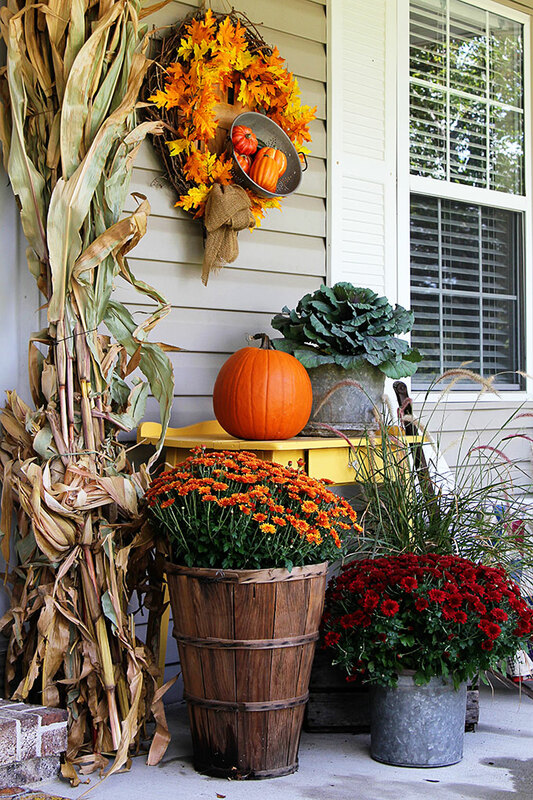 I’m decorating my porch like your post called TRANSITIONING THE PORCH FROM FALL TO HALLOWEEN. Thank you so much for sharing information on what kind of plants some were besides the mums. Will post finished project soon or as soon as I’m done with wreath, everything else is done and up. This is a great blog.